New Year's Eve -- that's so money! When we lived over on Vermont Ave. what seems like 100 years ago, we used to walk across the street and listen to them sing old chestnuts like "Come Fly With Me" and "The Way You Look Tonight" (not to mention "Stayin' Alive") as we drank apple martinis (me) and gin gimlets (Ian). 2008 has been a challenging year. We're eager to take a little parenting break to ring in a more "money" 2009. Happy New Year and have a safe and wonderful holiday! Yesterday we took a drive through Beverly Hills, and our first stop was for sustenance ... cupcake-style. I went through my Sprinkles phase a couple years ago, but it's always nice to visit an old addiction. For those of you who haven't been to this little bakery, it's an adorable closet-sized storefront on Little Santa Monica Blvd. 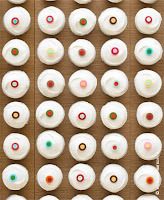 The cupcakes themselves, (right, courtesy of Sprinkles) range in flavor from chocolate marshmallow and red velvet to pumpkin and cinnamon sugar. 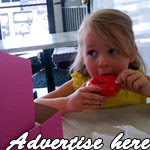 They have a minimalist design and are usually topped with their signature modern candy dot. After ordering our half-dozen, we headed up Beverly Drive to the base of Coldwater Canyon, where its eponymously named park often plays host to celeb babies. We didn't see any famous progeny yesterday, but C enjoyed sharing shovels, tricycles and her ladybug ball with the other tykes. On the drive back home, we headed up Coldwater to Mulholland Dr. to take in the windy roads and gorgeous views of the San Fernando Valley on one side and downtown Los Angeles on the other. It was a perfect drive, so perfect that C hit her internal snooze button and drifted off into sugary slumber. Grandma's in town from Oklahoma, and, in addition to present madness, we built an adorable gingerbread house, courtesy of Trader Joe's. Daddy was a big help, too, as we took turns beating the egg whites into meringue-like submission; holding the gingerbread rooftops together for its powdered sugar masonry; and giving C a nibble or two before putting everything together. Ta-dah! Our finished product, the Clark Gingerbread House. There's something magical about snow. 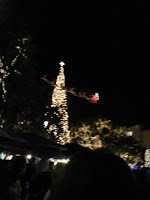 Particularly in L.A.
C and I were doing a little Christmas shopping at the Grove tonight, and after the fight for parking, the wait for the elevator, the up-close and personal bumps followed by the requisite "excuse me's," we walked out of Barnes & Noble to find snow falling gently from the chilly sky as Bing Crosby sang "White Christmas." Shoppers turned their eyes upward, like tourists gawking at the skyscrapers in New York. Children reached their hands in the air, as high as they could go, desperate to clinch one more flake and watch as it melted on their fingertips. All for a taste of something that doesn't really exist here (except in freak circumstances like this week when Las Vegas and parts of SoCal were blanketed in white). Of course, the snow was man-made. And of course Bing doesn't sing to those plowing their way every day down East Coast streets. But it's what the Grove, and this city, do best. They set the perfect scene. They know how to create moments. And they know how to nail it in a single take. In fact, it's exactly what this city's best known for. Now, I won't veer into Grinch territory and mock it as manufactured because I was honestly stopped cold, if you will, when I stepped outside the bookstore. It was perfect ... if only just a magically brilliant illusion. While being attacked by the atomic superbug from hell these last couple days (for me) and over the weekend (for C) -- Ian, luckily, only caught the wimpy younger brother of the atomic superbug, wackbug -- we indulged in a little 25 Days of Christmas on ABC Family. There was "The Year Without a Santa Claus" -- a retro stop-motion program that might instill puppet fear if it weren't so old -- "A Miser Brothers' Christmas," three words: fireball freak show. There was also The Chronicles of Narnia: The Lion, the Witch and the Wardrobe. C didn't stay up for that one. It reminded me of one of my favorite Saturday Night Live skits from a few years back. Lazy Sunday from 2005! I have to upload the video here for posterity and to show C what made her mother laugh for months. Months! I tried to bring the concept of creating a similar rap-apalooza to Variety called "Crazy Thursday" -- a big deadline day -- but the idea didn't catch on. In fact, I felt the cold chill of defeat when someone told me I was flying my freak flag too high. OK, no one actually said that. But I could see it in their eyes. So here's the original, and, alas, "Crazy Thursday" will have to live in that white-guy-rap-loving, cupcake-macking, deadline-crazy place in my mind. Nerd up, C. It's in your genes. After an unfortunate sick day on Saturday, reminiscent of another Saturday last month, C and I decided to stay inside, watch way too much Mickey Mouse Clubhouse and Little Einsteins and stick to bland foods ... heck, make that just water. Ian had gone to Las Vegas for the weekend to catch up with some guy friends, and by the time today had rolled around, I was determined to get outside. So what did we do? While Ian hit the Strip, we hit ... San Gabriel! We had been there before, namely on a trip for soup dumplings and massages with friends from work, but this time C and I were in search of a park that my friend Pat had recommended, Vincent Lugo Park, known for its playful and kid-friendly animal sculptures (see photo below, courtesy of Vincent Lugo Park). However, in my haste, I wrote down the wrong directions and ended up at a nearby community center. The people outside setting up for a holiday fair were friendly but came thisclose to asking me if I was insane. Not kidding. I could see it in their eyes. Me: "Do you know where the park is that has dolphins and dragons?" Me: "You know," and here's where I just moved my arms up and down in a wavy motion, "that kids can climb on?" I then pointed toward the backseat, where C was sitting patiently, as if to show them that I did, in fact, have a kid and that I wasn't looking to climb on any dragons myself. "You mean the zoo?" one of the women offered. "Seriously? What zoo offers dragons? And komodos do not count," I said, in my mind. They ended up pointing me in the direction of the nearby Smith Park. 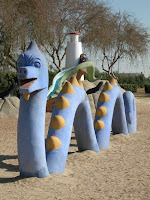 There weren't any dragons, but there were a few seals and a little whale that doubled as a slide. Not only that, but we stumbled upon a man playing a traditional-looking Chinese musical instrument. He called it something that sounded like "tai nah," but when I Googled the instrument, the word "erhu" kept appearing. Luckily, the man was kind enough to play for C and me and allowed me to take a little video. Again, one of the things I love about L.A. is its multiculturalism. San Gabriel has a large Chinese population, and it's so great for C to get to experience different cultures first hand. The town is also home to a beautiful mission district, which includes the San Gabriel Mission Playhouse, where C is standing in the above photo, the San Gabriel Mission Church and the old Grapevine Park facade (below), behind which stands an actual grapevine planted in 1861. It was a lovely detour, and even though we didn't make it to our intended destination, we got a little lesson in Chinese culture. I'm just hoping "tai nah" doesn't mean idiot ... or worse. This postess with the mostess is mostly a shoutout to my friend Sara's new online boutique, Adelie. I've touched on my two trips down to Pedro, as they say sans the San, here and here, but I wanted to give a visual sampling of my own to show what she has to offer. For C's birthday, Sara found the most adorably vibrant Lilly Pulitzer terry-cloth cover-up (see photo, above). It's a little big for her now, but it will be great for next summer apres pool. My latest trip down the 110, last Saturday, yielded an amazing bounty of vintage clothing. Besides the Exclusively Misook top and the ultra-femme Lady Manhattan blouse and (don't forget!) the perfect red-carpet black dress from Laundry by Shelli Segal with the cinched torso, I also snagged this delicate Alfred Shaheen cocktail dress from the 1960s. '60s! He was a Hawaii-based designer, which is illustrated by the two hibiscus flowers on the skirt (see photo, right, courtesy of Sara Farr). Shaheen also signed (!) the dress as well. I wish it were summer, C. You and I would show the world -- or perhaps, just L.A. -- how clothes are worn. Lilly Pulitzer and Alfred Shaheen would accompany us down the runway that is 3rd Street or Wilshire Boulevard. Santa Monica or Sunset. I would hold your little hand in mine as the sun beat down upon us. And we would smile and laugh like those untouchable beautiful girls in a John Fante novel. In the meantime, I'm here. I'll wait. But, yes, C, if you don't already know, your mother is such a girl. It was birthday-palooza for C this weekend, and man did we paint the town in various shades of high-fat, high-calorie frosting. So what did we do after he drove nearly the entire length of the country? Drove some more! I had to make last-minute stops at Target and Michaels (in Glendale), and after getting stuck on the 5 as people lined up for the Griffith Park Light Festival, my dad was reminded of the face-slapping reality that, like, 8 million people live here -- and drive here. It was about that time when he began plotting his 2,000-mile trip back home. And counting the minutes until he could do so. The next day, Saturday, was C's birthday party at Pan Pacific Park. We were so lucky that the weather was absolutely gorgeous. Particularly for December, when I was sure it would rain, hail, snow or rain frogs from the sky. But it was perfect. Warm. Sunny. Beautifully L.A.
Of course, before we got to the actual park we had to make a run back to Glendale. We had to pick up C's "Under the Sea"-themed cake from the amazing Porto's. I could practically hear my dad's nerves fraying. The party itself was very cute. C ran around with her little friends, while her parents ran around after her. 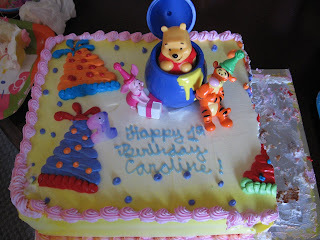 The cake was a hit, C was a hit, and everyone had fun. One of the things I hope will stay with me is when my dad and C figured out his "official grandfather name" -- which turned out to be something I hadn't considered. I've always referred to him as "Granddaddy" because that's what I always called his father. But C kept looking for her own father when I'd say that word. She couldn't differentiate between daddy and granddaddy. Finally, my dad said, "How about Pa-Pa?" (I'm trying to get the spelling right because it's not exactly "papa.") And she said it. Just like that. And it stuck. But that was after I made a short trip of my own down to San Pedro to my friend Sara's clothing party celebrating her online boutique Adelie. Forget OU, I was the one who scored -- clothing-wise at least. She gave me an amazing deal on vintage designer dresses, tops and jeans. On Sunday, we headed to the El Capitan to see "Bolt" on the bigscreen. Not only did we see the movie in 3-D, we also saw the live holiday stage show before the movie. My dad was enthralled. C wasn't crazy about the glasses, but she sat through the entire movie -- and even tried to climb onstage. My dad had to head back to Mississippi but not before we grabbed lunch across the street at California Pizza Kitchen. And not before I had to run one last errand. To pick up C's Christmas pictures. In Glendale. Now, obviously my dad loves me. I say that because by the time you finish reading this post you might get the idea that ... well, you know the rest. Happy Birthday, C! You're 2! Happy 2nd Birthday, my darling. I love you more than you'll ever know. And, below, Dec. 4, 2006. Your first day! I love you! Puppet theater pulls (heart)strings in L.A. I can't believe I had to go to the New York Times to read an interesting story about a modest, off-the-beaten-path children's puppet theater in downtown L.A.
Well, actually I can. Thank you, Sam Zell. In Jennifer Steinhauer's story, "Forget Citigroup, Puppet Show Needs a Bailout," she describes the man behind the Bob Baker Marionette Theater, located "(n)ear a freeway overpass on a decidedly scrappy edge of downtown Los Angeles." Apparently Baker (pictured left) has been creating marionettes ever since he was a student at Hollywood High, and his shows are a "staple of a Los Angeleno childhood." Who knew? Apparently, a lot of people used to know, but now not so much. Either that, or everyone's just over their "scrappy" phase. Unfortunately, Baker's theater, which opened in 1960 and houses some 3,000 puppets, is in serious debt and looking for support. I wish I had known about his theater earlier. 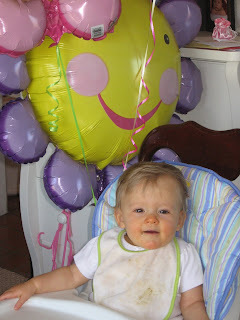 Birthday parties are apparently a specialty, and guess who's turning 2 this week? Luckily, his staging of the "Nutcracker" is still playing and could be a fun adventure for C in the coming weeks. 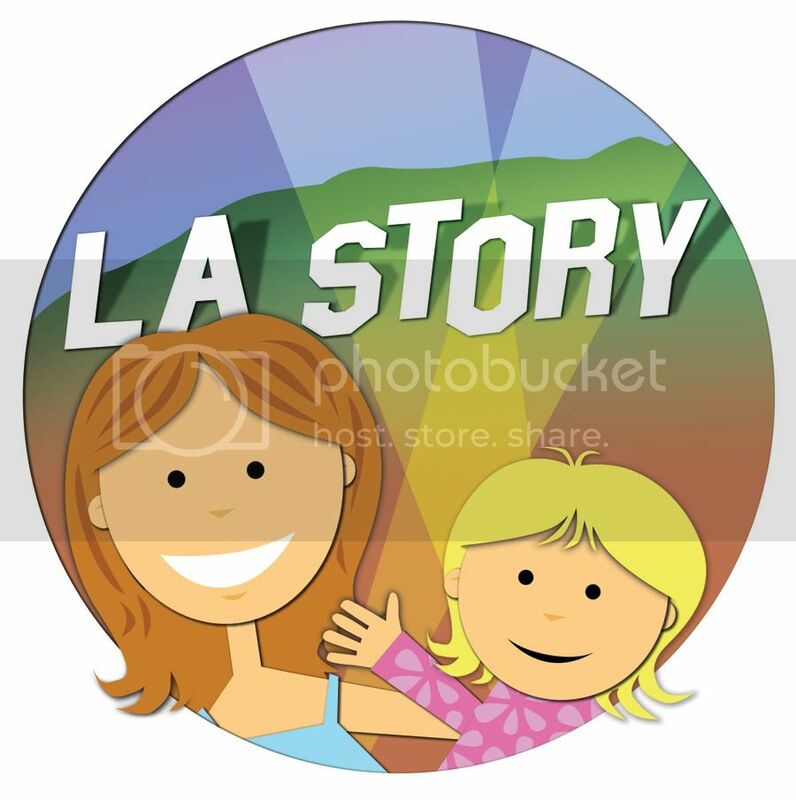 Which leads me to my own plea for support: If readers have any ideas for other below-the-radar L.A. activities for children, please leave a comment or email me at losangelesstory@gmail.com. After all, it's not as if I can rely on our own Times.